Kit Harington as Jon Snow, left, and Emilia Clarke as Daenerys Targaryen in a scene from "Game of Thrones." 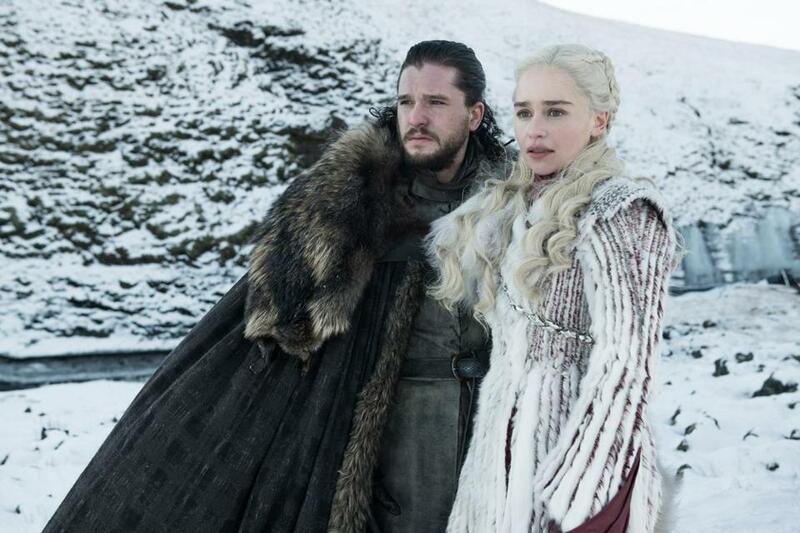 The final season of “Game of Thrones” arrived under such a fur-lined cloak of secrecy even the title of Sunday’s premiere episode — later revealed as “Winterfell” — was concealed prior to broadcast. But it should have been obvious all along that, as the series entered its final stretch, the Starks’ ancestral stronghold would play a central role. It’s where we first started, back in season 1, honorable Ned opening Winterfell’s gates for King Robert Baratheon and unwittingly acquiescing to a power play that would not only cost him his life but bring House Stark itself dangerously close to extinction. Throughout the series, it’s been a key setting both thematically and strategically, the oft-pillaged capital of the North and the snowy domicile of the clan whose brutal expulsion across Westeros and eventual, hard-won reunion stands as cohesive a narrative arc as this show has executed. With “Thrones” entering its endgame, it’s the only place many of these characters, battered and bloodied though they may be, have left to call home. Episode director David Nutter makes all this clear from the jump. In an elegant callback to the “Thrones” pilot, a child rushes to watch the arrival of an unfamiliar armada, dimly aware that their survival could hinge on correctly marking the entrants as friends or foes. A far cry from the Baratheons’ royal court, the newcomers this time are Jon and Dany, having marched from White Harbor at the head of a rather fearsome army. The pair cut a handsome figure: him scowling black, her alabaster white, both about as assured as you’d imagine two leaders flanked by dragons to be. The three Starks in Winterfell — Sansa, Arya, and Bran — watch this procession with predictably mixed emotions; though Jon’s return would seem a cause for celebration, that he’s bent the knee (and then some) to a Targaryen queen puts them all in the uncomfortable position of greeting a long-feared enemy with both friendliness and implied fealty. “Northerners don’t much trust outsiders,” Jon tells Dany, who seems reluctant to take into account how the Northerners feel about much of anything. But for him, at least, this feels like a real homecoming. “Look at you,” Jon says, approaching Bran for the first time since his season-one departure for the Wall. “You’re a man.” The weirdest Stark looks back at him with that eminently punchable smirk and replies, “Almost.” Jon’s reunion with Arya is much warmer, the pair embracing under the weirwood heart tree in Winterfell’s godswood; still, there’s a little tension when Jon, intent on smoothing over Dany’s arrival, criticizes Sansa to Arya for her reluctance to roll out the welcome mat for the Dragon Queen. “Sansa thinks she’s smarter than everyone,” says Jon. Sansa’s views on Jon swearing loyalty to Dany will undoubtedly power some of the conflict ahead in Winterfell. All present are aware of the looming threat posed by the Night King (especially given that, as Bran bluntly points out, Dany’s slain dragon Viserion is now riding with the icy conqueror). But in the Great Hall, more is made of Jon’s choice to ally with a long-time exile, especially by those who swore loyalty to him (and him alone) as the King in the North. It’s worth remembering what happened to Jon the last time he brokered an unorthodox alliance; and with Melisandre out of sight this week, there’s no reason to think he can’t perish more permanently the next time he sticks his neck out a bit too far. Dany certainly isn’t doing much to ingratiate herself up north; she comes off as deeply cruel in relating to Sam the news she executed his father and brother up at Highgarden. The pain on his face, and the tears that spring to his eyes, tugged at the heartstrings. Speaking more broadly, reunions were the name of the “Game” this week. The biggest takes place in the crypts of Winterfell, when Sam approaches Jon and — still aching from his talk with Dany — breaks the news to him of his parentage. Jon’s understandably shell-shocked to learn of his very legitimate claim to the Iron Throne, especially since he’s always been the one who’s least fancied himself a king. There’s also the not-insignificant matter of his blooming romance with Dany, which is about to get infinitely more complicated now that he’s in the loop about not only who he is but what that makes her to him (other than an ideal dragon-riding companion). Sansa’s well aware and, with Littlefinger permanently silenced, more assured of herself than ever; there’s not a trace of hesitation in her dismissal of Tyrion’s (uncharacteristically foolhardy) claims that Cersei will march with them against the Night King. “I used to think you were the cleverest man alive,” she says scornfully. Speaking of Cersei, her alliance with Euron Greyjoy is progressing back in King’s Landing. The Westerosi Jack Sparrow has returned with an army of mercenaries from across the Narrow Sea and (though they come minus the elephants the Mad Queen wanted) she nonetheless rewards his loyalty with an off-screen romp in the hay. It’s disappointing that Cersei’s role in this first episode is restricted to bedding a pirate, especially since he guilts her into it as one of the few powerful allies she has left on the board. (That said, Theon’s sneaky rescue of sister Yara from Euron’s ship raises some serious questions about the quality of their uncle’s forces.) Slightly more telling is Cersei’s instruction to sellsword Bronn, related by Qyburn, to head north on a mission to assassinate both Tyrion and Jaime. Ever catty, she’s even assigned him a weapon to do so: the same crossbow Tyrion used to kill dear old dad Tywin Lannister. “This [expletive] family,” sighs Bronn. Plenty of blood will be shed before “Thrones” closes this final chapter, but the first episode back reminded us what’s kept so many of these characters fighting. Though Dany yet seeks the Iron Throne, and Sansa seems to be settling comfortably into her new leadership position in the North, it feels significant that the moments of real joy in “Winterfell” came when characters finally set aside their armor. There was Jon and Dany tenderly embracing in front of a waterfall where he used to hunt as a boy. Arya twirling back around to smile at Gendry. Her elated reunion with Jon in the godswood, too, was a moment of true warmth. “Thrones” has derived much of its drama from pitting blood against blood. But the premiere suggests another way, if these characters can survive the conflicts to come. Dany spoke last season to Tyrion of “breaking the wheel” that’s embroiled Westeros in a bloody power play for longer than she’s been alive. “It’s a beautiful dream, stopping the wheel,” he said then. “You’re not the first person who’s ever dreamt it.” As “Thrones” begins its final act, it’s easy though foolish to be hopeful about the children of a generation torn asunder by war beginning to share the vision of some brighter future. That is, of course, until the Night King shows up. We imagine he’ll have some thoughts on the matter.